Entering its seventh year, #GivingTuesday is a global day of giving fueled by the power of social media and collaboration. #GivingTuesday harnesses the potential of social media and the generosity of people around the world to bring about real change in their communities; it provides a platform for them to encourage the donation of time, resources and talents to address local challenges. It also brings together the collective power of a unique blend of partners— nonprofits, civic organizations, businesses and corporations, as well as families and individuals—to encourage and amplify small acts of kindness. Last year over 2.5 million people helped raise $300 million in over 150 countries. HHRD has joined #GivingTuesday in harnessing the collective power of our donors and their communities to encourage philanthropy and to celebrate generosity worldwide. Our efforts will focus on our Skills Development Program with the goal sponsoring 275 Students, for the cost of $100,375, in our Skills Development Centers. HHRD currently provides training to men and women in 6 countries. These centers set out to impart training, organize artisans, assist in specializing products, improving product quality and then marketing these handicrafts. We have helped 400 people in Jordan, 150 in Somalia, 130 in Afghanistan, 2,570 in Pakistan, 250 in Nepal and 650 in Kenya this year alone. “I am thankful to HHRD from core of my heart and pray for its development so that more helpless and poor girls like me can avail opportunity of skills enhancement and change their lives by using their skills”. Aisha, a resident of the village Tando Allah Yar in Sindh, Pakistan, lost her father when she was two months old. After his death, it was difficult for her mother to manage the home alone with three other children. As a result, her mother became a domestic worker in various houses in order to pay for their education. Unable to continue these payments Aisha felt the burden of responsibility to help her mother despite her own reluctance. Seeing her daughter unhappy Aisha’s mother arranged for her to attend a Skills Development Center in the area. After attending a six months sewing course Aisha also took on jewelry making, tie dye and glass painting. It soon became a family affair with her brother helping display her handiwork at the local market. HHRD has also hired her services as a trainer for short courses; now she supports her younger sister’s education. Souad Shehadeh- Um Mohammad is a Syrian refugee with three children. She suffered much when she came to Jordan to find a home. Her husband brings in barely enough income to cover their rent and food. In order to support her family, she joined HHRD’s Skills Development Center sewing training course and benefited from the ‘sewing machine’ gifted from the sister Suzanne Itani grant. 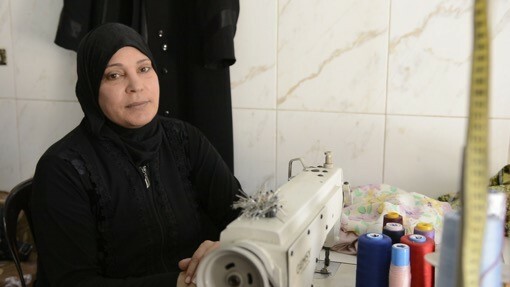 In the beginning, she worked at home; she later went to open a sewing workshop called "Makhiatat Al Noor” near her home. Currently, she earns a steady income to support her family. Moreover, she is expanding her workshop into other areas as well. Double your donation to HHRD by visiting the following link https://doublethedonation.com/giving-tuesday/, find your company and use the form to fill out your donation. It's as simple and easy as a click and you're on your way to helping.